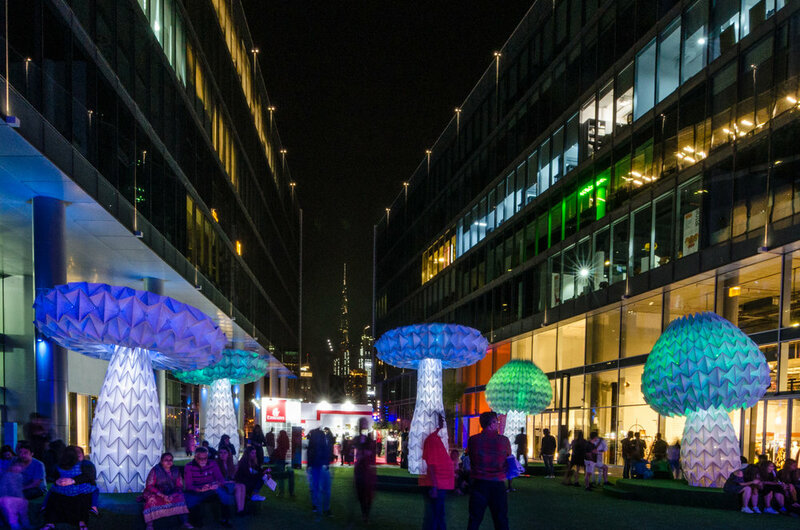 See them now as part of the No Spectators exhibition at the Cincinnati Art Museum in Cincinnati, Ohio as well as the LUMENous GARDEN at Pacific Place in Hong Kong, China. 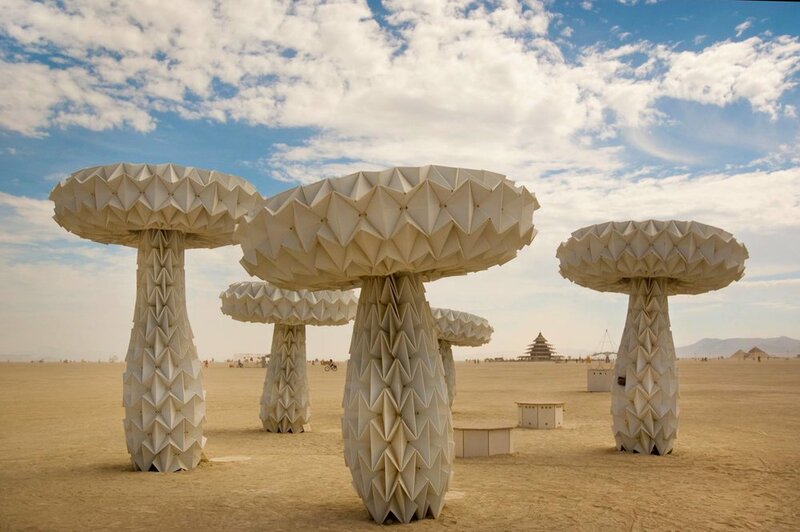 A garden of five origami mushrooms with caps that expand and contract from a flat umbrella portobello to a bulbous cap when visitors activate them, creating a surprising and delightful experience. 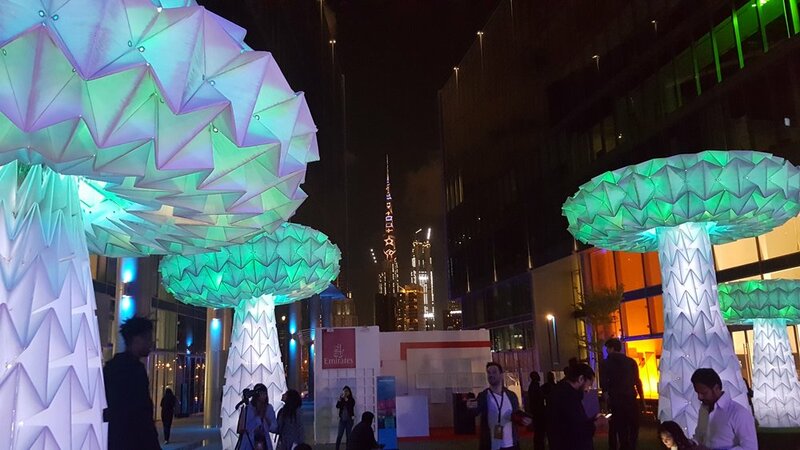 Each mushroom is made of 18 sheets of corrugated plastic, a total of 83 square meters, hand-folded and carefully welded together. 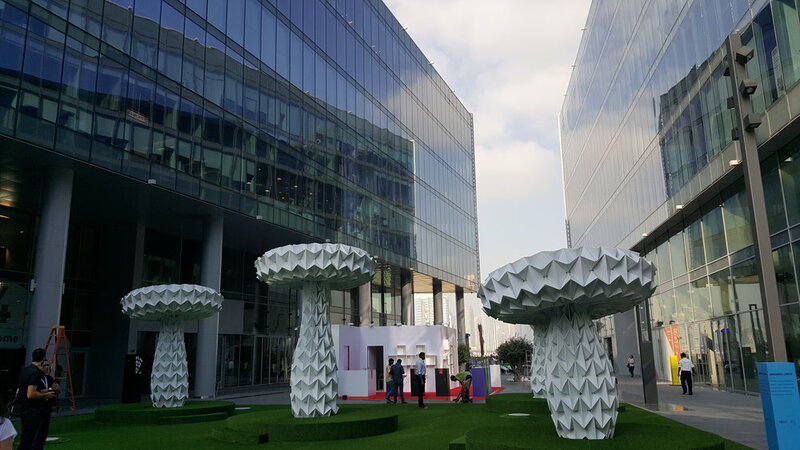 A solid mechanical structure made of aluminum and steel defines the shape of the mushroom head. An umbrella-like mechanism powered by an industrial actuator causes the cap to change shape. 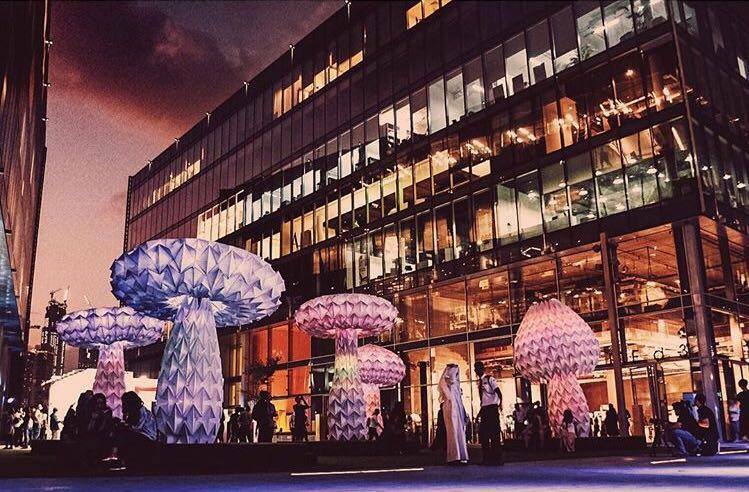 Pressure pads, located at the base of the mushroom, activate the movement, and at night, over 1,600 LED lights create a spectacle for those near and far. 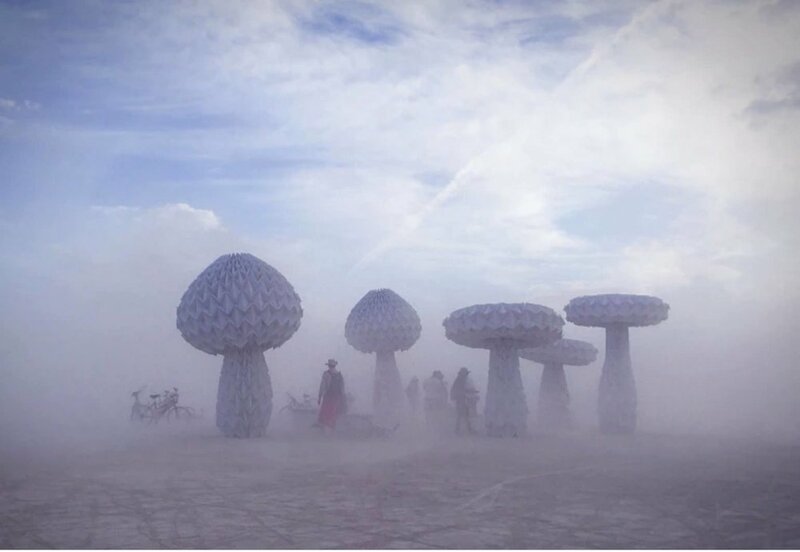 Nearly every one of the hundreds of parts for each mushroom were custom made by the FoldHaus team. 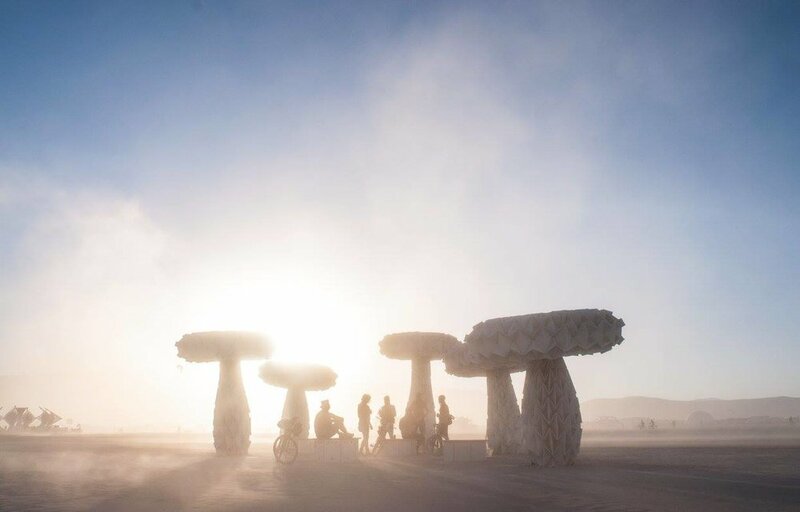 Shrumen Lumen premiered at Burning Man 2016, and is currently on view at The Smithsonian American Art Museum. Shrumen Lumen is based on an origami crease pattern called Waterbomb Base pattern, and inspired by the unique transformation of the Origami Magic Ball, designed by origami artists Yuri and Katrin Shumakov, who were first to enclose the pattern and create its beautiful movement. Read more about their work here. Shrumen Lumen was made possible by the work and contributions of many. 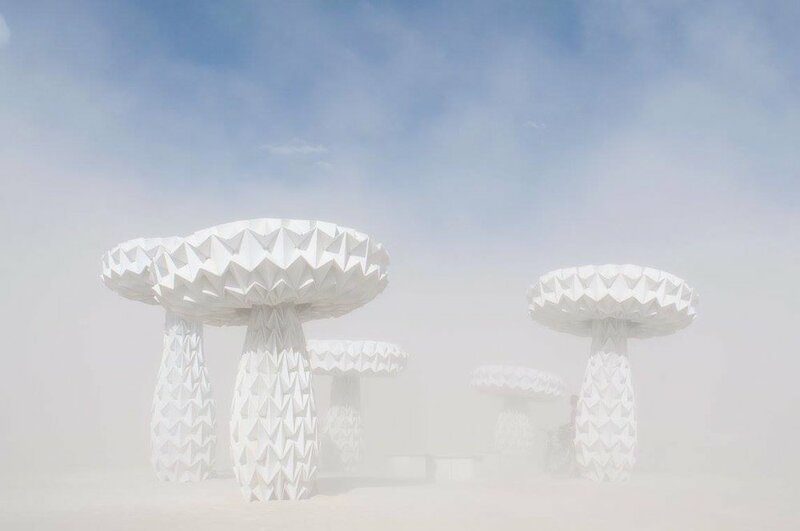 In particular, we'd like to thank Burning Man Arts and IDEO for their generous support, as well as the supporters of our Kickstarter campaign. 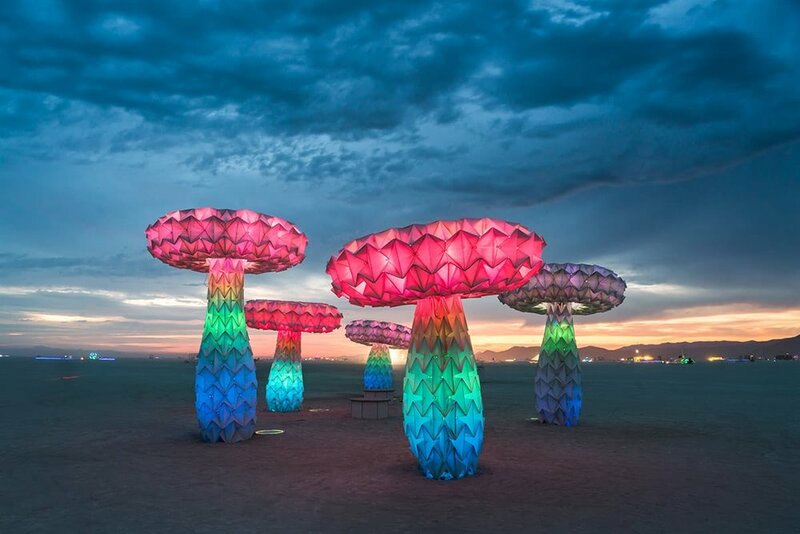 Shrumen Lumen is on exhibit for No Spectators: The Art of Burning Man at the Cincinnati Art Museum in Cincinnati, Ohio. Available for public viewing April 26 – September 2, 2019. 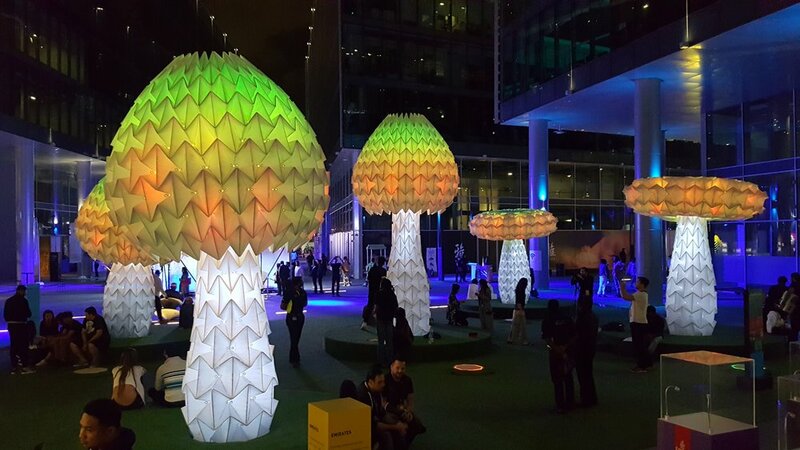 Shrumen Lumen is currently also on view at Pacific Place in Hong Kong, China as part of the installation LUMENous GARDEN. Open to the public from March 19 – April 14, 2019. 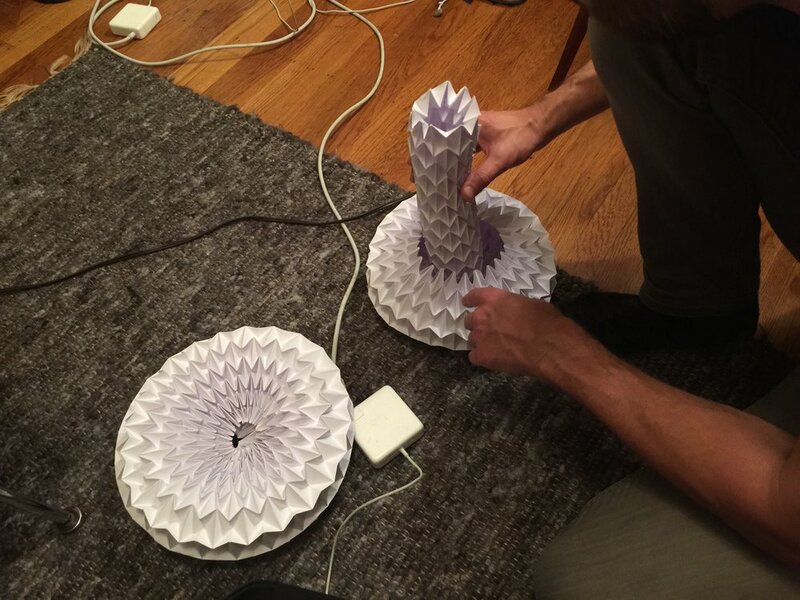 This folding pattern, inspired by the Origami Magic Ball design by Yuri and Katrin Shumakov, has the interesting property of transforming from a cylinder to a sphere. Folding it, even with pre-scored paper, can take several hours. 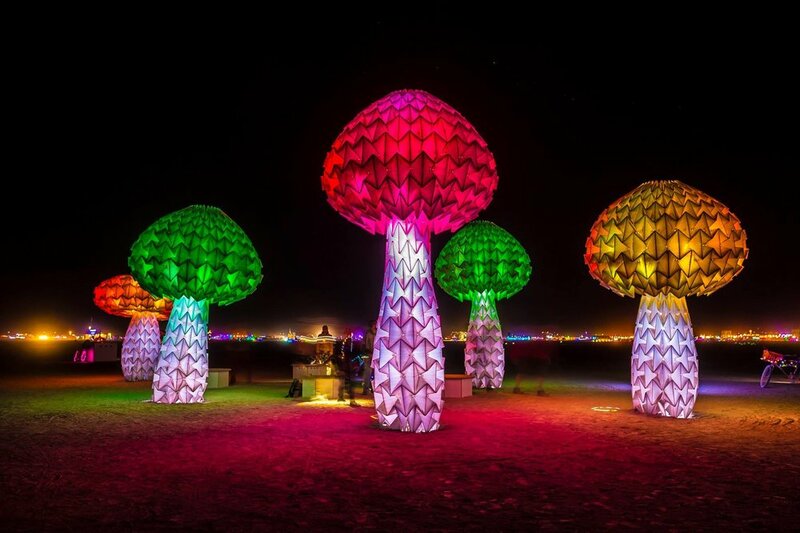 To create a full-scale mushroom cap, 18 individual sheets of corrugated plastic were hand-folded and welded together. The folding of this 83 square meter fold pattern required more than a dozen team members to push and pull the material. Once the metal structure was integrated into the mushroom cap, the built-in motor showed the full range of motion, and change of shape in the Shrumen's head. Each mushroom cap contains a complex mechanism that connects the plastic shell with the internal steel structure. Creating these parts required specialized expertise, and many hours of custom fabrication. 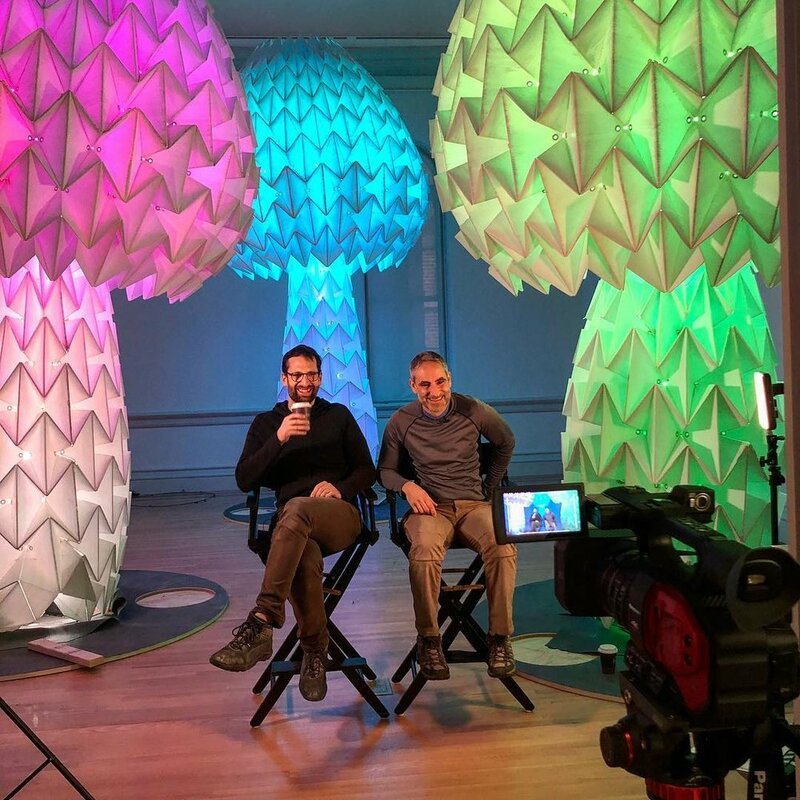 In addition to soldiering hundreds of LED strips and programming light patterns for the Shrumens, the Interaction Design team developed pressure pads that people could step on to activate the mushrooms to change shape. Hundreds of individual parts needed to be hand-made to complete each Shrumen sculpture, requiring many volunteers' contributions. The set up in the desert required heavy machinery including trenchers, augers, cranes, scissor lifts, and a lot of sweat.